< Schematic design sketch for Glaser Residence. 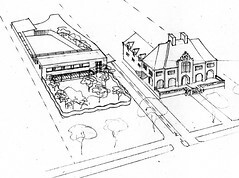 A 1948 design by Harris Armstrong for a new home to be constructed on Lindell Boulevard in Saint Louis. This street contains many historic, imposing homes based upon various European nineteenth century precedents (French, English, Italian, etc.). The sources include Neo-Classical, Gothic, Romanesque, Beaux-Arts, and Tudor. This sketch represents a concept for the house that didn't progress beyond this stage. Armstrong prepared a contract for Joseph Glaser, Jr., but it remained unexecuted. Armstrong's design draws on the work of Le Corbusier and Alvar Aalto in its exterior composition. Since the primary facade faces south, Armstrong provides a horizontal plane to protect the glazing from the summer sun. The overhang, series of windows, and overall facade composition appears somewhat similar to his design for the Clayton YWCA (sans bar joists). Armstrong sets the primary facade farther back from the street than the adjacent home which reflects the standard setback. Instead, he inserts an undulating wall enclosing a private garden in the front of the house, creating is essence two courtyards.